Rewarded in particular by Coutelia d'Or, the line of Thiers of Denis Goyon remains a reference as regards cutlery. The choice of materials, the quality of the completions and the pure silhouette of Thiers of Denis Goyon are faithful to the top-of-the-range image of the production of its cutlery. Companion of the brotherhood of Couté de Tié, Denis Goyon endeavoured to preserve the sober lines imposed by Jurande du Thiers all while bringing his know-how there and the completion "any metal" dear to his manufacture. 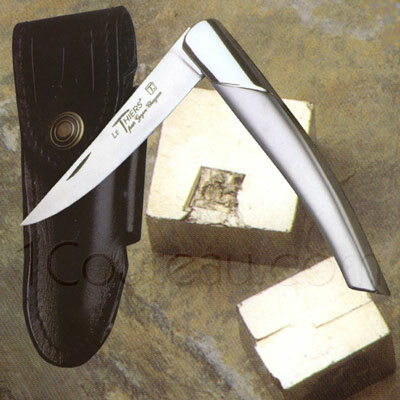 Thus the pocket knife Thiers is a closing knife, a part, full stainless, which exists in two completions: entirely shining or sanded chechmate.